One of the many amazing things about Cornwall is the sheer number of really ancient stones and monuments that are literally just lying in fields, waiting for people to notice them. Once you’ve visited a few, you find yourself peering past every hedge looking for more. Every year we revisit a few favourites, and I always find them fascinating and inscrutable. The legends which often surround them are also fascinating. 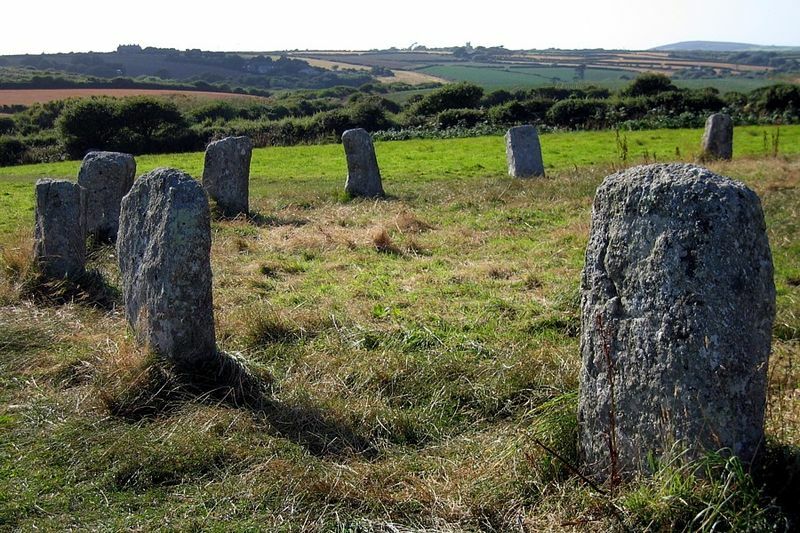 Probably my favourite is the Merry Maidens (left), near to Trewoofe and Porthcurno, which is the most complete stone circle in Cornwall – 19 granite stones, of similar sizes and perfectly evenly spaced. Legend has it that they were girls who danced on a Sunday, and were turned to stone for not observing the day of rest (this legend was probably put about by the early church to discourage pagan practices in Cornwall). Their pipers, who provided the music they danced to, are represented too, by two stones at either end of the field. 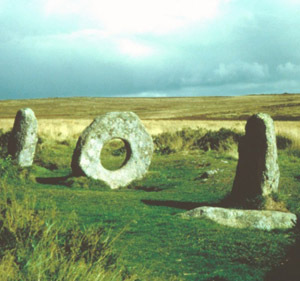 Another amazing place is Men-an-tol (right), which means “holed stone”, near Madron. There’s plenty of information about it here, but I must say that I am particularly amused by the legend that a person suffering from rheumatism or spinal problems should crawl through the hole nine times, facing the sun, in order to be cured. It’s not a very big hole, even for bronze-age adults, and I decided against trying to see if I would fit, but surely if you are in pain already this is the last thing you’d want to do! It’s a fascinating place, though, and there are spectacular views from Men-an-tol. Another place not to be missed is Lanyon Quoit (below), an ancient dolmen also known as the Giant’s Table. Apparently, this used to be much taller than it now is, and until the eighteenth century, one could ride under it on horseback. Then, one of the supporting stones broke, and when it was repaired, it was much shorter. Now, you might be able to ride a small dog under it, but I couldn’t stand upright. It may have been a burial mound or a cenotaph, and it seems that some kind of pagan ceremonies were performed there. I imagine it’s popular with local druids and hippies. There are loads more places – you could spend weeks wandering from one to another (and getting quite lost in the process – we were helped greatly by a recently purchased ordnance survey map). One of the places I haven’t yet been, but am keen to go, is Chysauster, an ancient village just outside Penzance now managed by English Heritage. You get a wonderful sense of how truly ancient Cornwall is, looking at these places and imagining what might have gone on there in the past. 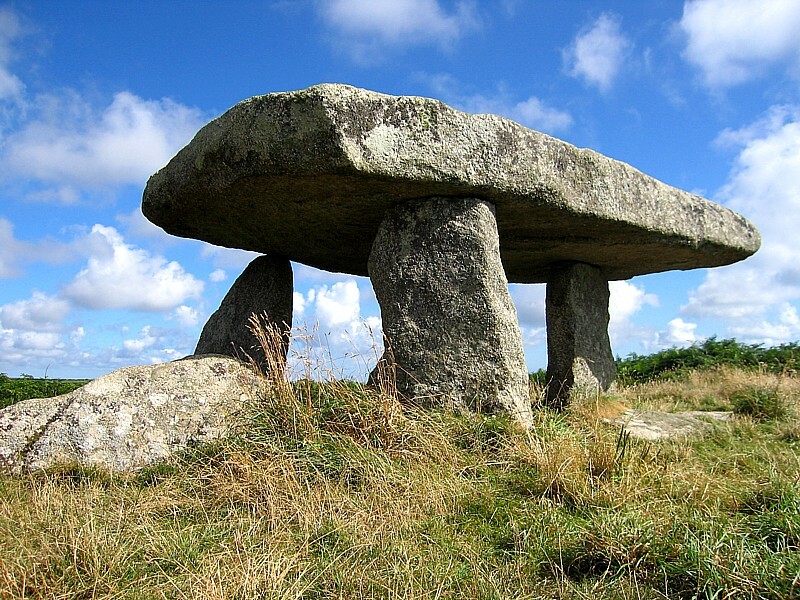 There’s plenty more information on Cornwall’s Archaeological Heritage site, which is very helpful.